Gala Christmas Choral Concert featuring Loyola Marymount University Consort Singers, Women’s Chamber Ensemble, and Concert Choir. Works by Willcocks, Rutter, Willberg, Forrest, Grancini, Victoria and others. 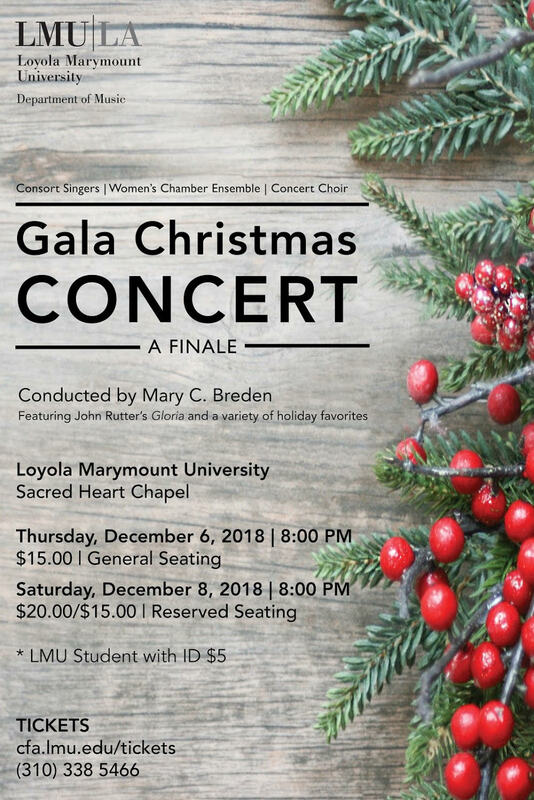 You know the holiday season has arrived when the Loyola Marymount University choruses present their Gala Christmas concerts. This year’s performances will take place on Thursday, Dec. 6, and Saturday, Dec. 8, in the Sacred Heart Chapel. The concerts – a more than 50-year-old LMU holiday tradition – will feature the Consort Singers, Women’s Chamber Ensemble and Concert Choir performing seasonal favorites as well as John Rutter’s Gloria. Two world premieres will also be featured on the concert – Paul Gibson’s “Sleep Holy Babe” and LMU alumna (Music, ’04) Amy Gordon’s “Light in the Darkness” a work commissioned for the LMU Choruses and dedicated to long-time director Mary Breden. Tickets cost $15 for Thursday, Dec. 8, and $15-$20 for Saturday, Dec. 10. Discounted rates are available to faculty, seniors LMU students can purchase a $5 ticket for either performance at the door with a student I.D.